The theory of aerodynamics is the culmination of the works of many individuals. It probably began with prehistoric man's desire to copy the actions of the bird and fly through the air. Early man, being unable to soar into the heavens himself, attributed to his gods the ability to fly. But the serious Greek philosophers began to question: What is this substance called air and can man fly in it? Aristotle conceived the notion that air has weight and Archimedes' law of floating bodies formed a basic principle of lighter-than-air vehicles. Men like Galileo, Roger Bacon, and Pascal proved that air is a gas, is compressible, and its pressure decreases with altitude. In the years around 1500 one man (Leonardo da Vinci) foresaw the shape of things to come. Through his avid studies of bird flight came the principles and designs that influenced others. Da Vinci correctly concluded that it was the movement of the wing relative to the air and the resulting reaction that produced the lift necessary to fly. 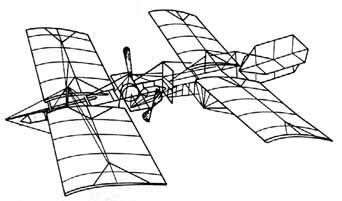 As a result of these studies, he designed several ornithopters- machines that were intended to copy the action of a bird's wing-the muscle power being supplied by man. But these designs did not leave the drawing board. His other designs included those for the first helicopter and a parachute. (See fig.1.) The first flying machine to carry man did not imitate the birds. Instead it was based on the lighter-than- air principle and took the form of a large hot-air balloon. (See fig. 2.) Constructed in 1783 by the two Montgolfier brothers from France, the balloon holds the distinction of initiating the first ascent of man into the atmosphere. Although ballooning thereafter became a popular pastime, man was at the mercy of the winds and could not fly where he willed. 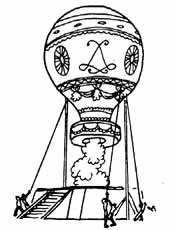 Gradually, his balloon designs acquired small engines and steering devices, but they remained lighter-than-air aerostat devices. Heavier- than-air flight was still years away. Figure 1.- Designs of Leonardo da Vinci. Figure 2.- Montgolfier balloon (1783). ...flying, now called hang-gliding, is enjoying a substantial comeback. Although there are various claims as to who really flew first (the French, the Germans, or the Russians), Americans are generally given the credit. At the Smithsonian Institution in Washington, D.C., Dr. Samuel Pierpont Langley was designing small steam-powered airplanes. His most successful was a 5-meter wing span tandem biplane (fig. 4), "the Aerodrome," fitted with a steam engine driving two propellers, which flew over 1 kilometer in 1896. Backed by a grant from Congress he built a full-scale version of the same airplane to carry a pilot. Unfortunately, launching gear failure caused it to crash twice during October and December of 1903. On December 17, 1903, the Wright brothers achieved success in a gasoline-engine-powered machine of their own design. Their success lay in continually improving their designs. Figure 4.- Samuel Langley's "Aerodrome" (1903). Today at Langley Research Center the research is being pushed forward in the areas of transonic, supersonic, and hypersonic transports, lifting bodies, and the space shuttle. The following material will shed some light on the how and why of an airplane's design. Figure 5.- Design showing advance of aeronautics.